Then depending on the report topic, the report may include coaching pages that were written to coach the individual in the assessment topic as it relates to their personal DISC Factor scores. Below we are going to look at Susan’s Report and show you how the report is laid out and what we can learn from her results. 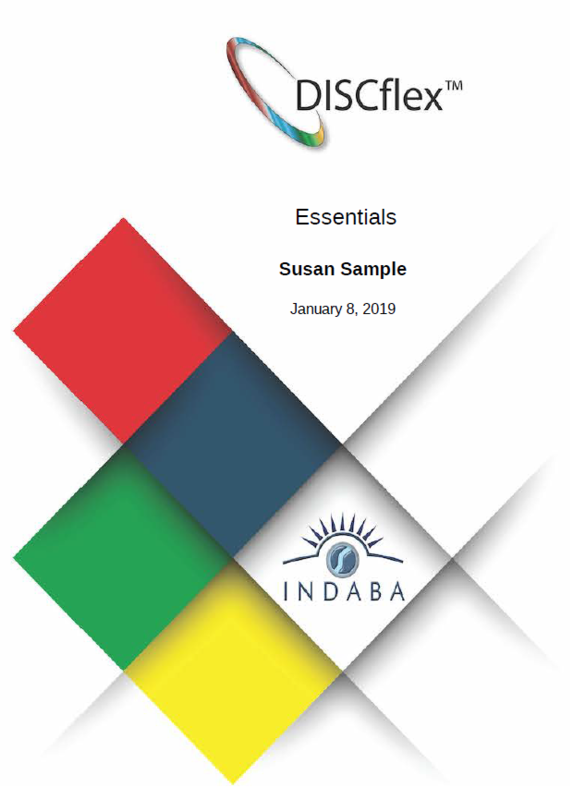 The introduction to our report defines the four DISC Factors and introduces our color schemes. You may notice the verbiage and colors differ from other DISC providers. We believe these terms and colors will be easy to remember as we set the foundation for learning DISC. It is important to note their are no right or wrong answers when completing a DISC assessment. We will simply measure your behavioral tendencies for each of the four factors. The goal being to provide you self-awareness on how you behave and language to use with others. Then once you are faced with a situation you can dial up and down your behavior as needed. DISC Patterns are the 30,000-foot view of how someone behaves. They give you a little bit of information on how someone behaves but should be taken with a grain of salt. There are 15 DISCflex Patterns. You can have one elevated factor, multiple, or even a flat line with no elevated factor. Each pattern has general characteristics associated with it. Using the above example for Susan: She has an “Elevated D Pattern”. Elevated D patterns would prefer to be in control of a situation and would be highly self-motivated in most situations. Now someone else can score as an “Elevated D Pattern”, but if their Influence, Steadiness, and Compliance scores vary from Susan they will likely behave much differently. This is why our reports focus on each person’s individual DISC factor scores. 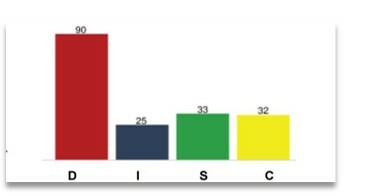 The Bar Graph shows the exact scores for an individual from 0 to 100 for all 4 factors. The higher the factor score the higher the likelihood the individual will display this factor’s tendencies. For example, Susan is highly likely (90) to display Dominance tendencies and least likely (25) to display Influence tendencies. Just because she has a Low I score does not mean that it is not part of who she is. Everyone has each factor in them and can use that factor. Susan can be influential she just may prefer not to be as it may cause her stress or she will be uncomfortable. In the report, you will find we include four strengths and challenges. The above picture shows a visual of where those words come from. Your strengths will always pull an adjective based on your DISC factor scores in that order no matter how low or high the score is. Meanwhile, potential challenges pull from the person’s DISCflex Pattern. For challenges, we provide you with adjectives that describe if you forget to use those other factors and only use the factor(s) in your pattern. For Susan, if she forgot how to use her influence, steadiness, and compliance she may find it difficult to focus, give up control, prioritize, and she may be making too quick of decisions. She does have those other factors so hopefully, they help her overcome some of those challenges. Our DISC Reports also include motivators and stressors that pull from both the person’s DISC Pattern and their individual DISC Factor Scores. In the visual above we see Susan’s first two bullet points for both motivators and stressors come from her DISC Pattern while the 3rd thru 6th bullet points pull from her individual factor scores. DISC Sub-Factors are unique to our version of DISC and help people understand how to practically apply what they are learning. Sub-factors dive into the difference between individual DISC factor scores and how they compare to one another. When one factor is displayed above another you get what we call a sub-factor. There are 12 sub-factors that create 6 spectrums. 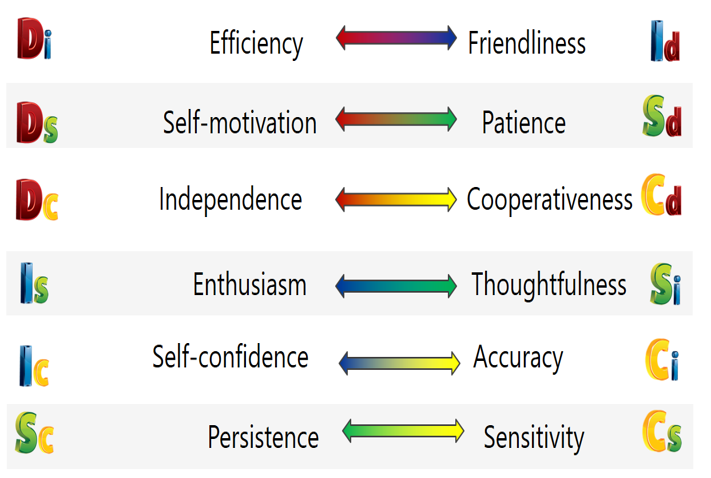 Based on your DISC results we know which side of the spectrum you will naturally tend to lean towards. In your DISC report, we examine the three biggest gaps between your DISC factors and provide coaching tips on the sub-factors you score the lowest on. Each sub-factor can be seen in a positive and negative way it is up to the person to assess a situation and determine the appropriate behavior. Once you understand what that is sub-factors are used to help you get there. Third Party Feedback is included with all of our reports at no extra cost. This section can be turned on/off at the group level. If turned on, the person will be able to invite other people to take a condensed 22 question survey on how that person views their behavior. Once the survey is completed and the person downloads their report the data is inlcuded in their Third Party Feedback Pages. The Third Party section is the only part of the report that looks at how other people view your behavior. 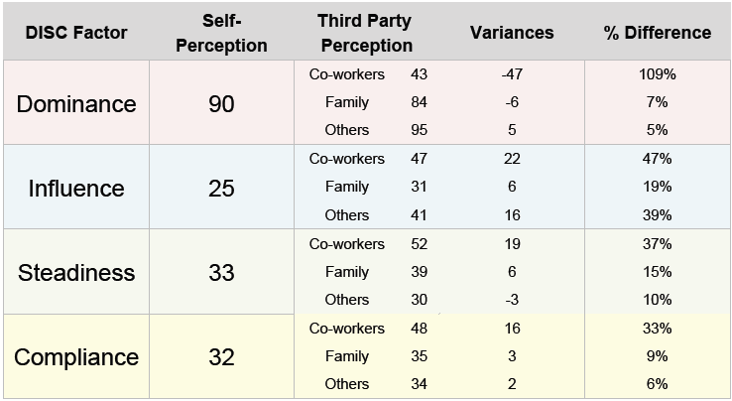 We have individual pages for co-workers, family, and others in relation to how they see you vs your self-perception. Once again there are no right or wrong answers but the data can provide you with a glimpse of how others view your behavior. The real question is who took this about you and why do you think they see you this way? Some people may act differently at home with their spouse and family then when at work and know and understand that others may be shocked. Depending on the DISCflex Program you selected you may or may not get coaching pages included in your report. The coaching pages are dependent on the report topic and vary in length. Each coaching page section provides detailed coaching information based on the sub-topics listed and the person’s individual DISC Factor Scores. At the end of your DISCflex Report, you will find Quick Reference Guides. These guides are generic and not based on your individual results. You can use them to help you identify behaviors in others as well as practice flexing your behavior. We hope you enjoyed the report debrief and are here to answer any questions you may have. We have developed additional materials you may be interested in Team Reports, DISC eLearning, and DISC Certification. Team reports provide you with a roster of each person’s scores as well as coaching tips for analyzing the team’s behavior. Our eLearning course provides you with 15+ hours of content delivered via videos, audio, and script materials. 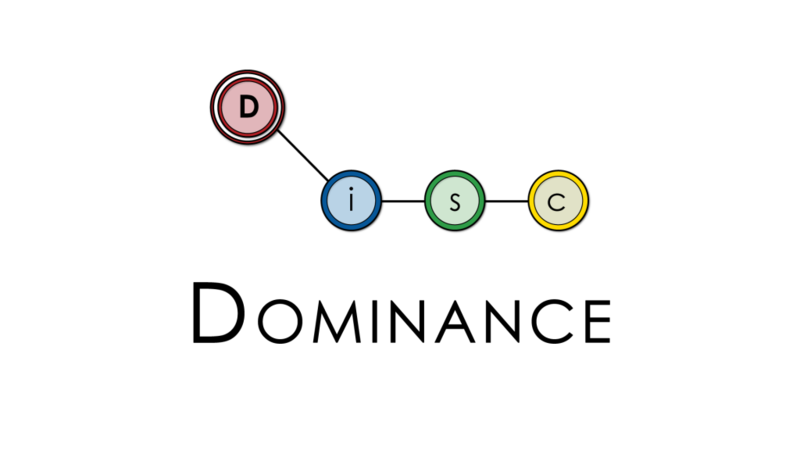 For Certifications, we train people to become coaches and subject matter experts in DISC. We have PPT’s and activities we provide our coaches with to use DISC from the front of the room. Please reach out if you would like to learn more.